Moving is one of the top sources of stress and fatigue. Relocating to an unfamiliar city or town can be even more daunting. That’s why we created Suburban Settlers. Our mission is to help individuals and families get settled into their new location quickly and easily. We save time, reduce stress and help newcomers feel right at home in no time at all! Relocating new team members? Let us help them and their families settle in with ease, so they can focus on their new position at your company, worry-free! 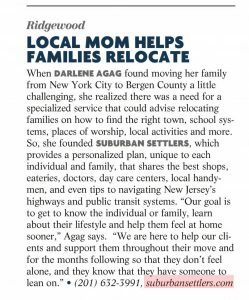 Suburban Settlers was featured in the July 2018 issue of Saddle River Magazine. Click to read the article. 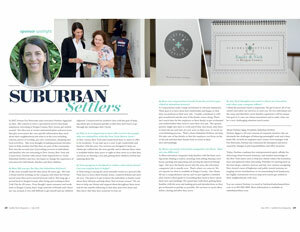 Suburban Settlers was featured in the December 2018 issue of 201 Magazine. Click to read the article. 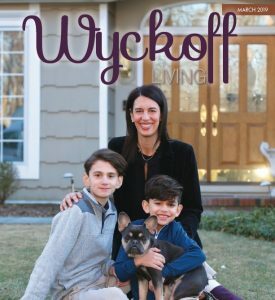 Suburban Settlers was featured in the March 2019 issue of Wyckoff Living Magazine. Click to read the article. Having worked in corporate Human Resources for 20 years, I’ve seen the challenges employees face when relocating. Suburban Settlers provides an invaluable service to employees and their families by helping them better manage the stress and complications of relocation. Their customized plan smooths out the transition into their new home and their new community. What an amazing time saver this is when settling into a new area! What a great service. It will help ease the transition of moving to a new area. A welcome addition to Bergen County! Suburban settlers was so helpful in finding local spots, sports leagues and more for my family. Moving from NYC to the burbs was stressful, but Darlene really helped us find all of the resources that best suited our family! Would highly recommend to anyone moving out of the city! I was thrilled with Darlene’s professionalism, knowledge about the area, and final gift to my relocation clients. I felt confident that she was delivering a trusted book of referrals to meet their needs and she anticipated their questions before we sat down. The wonderful feeling I walked away with after our delivery was unmatched – it’s why we do what we do in our business! As a real estate professional, I highly recommend her services to my colleagues. Moving my family from Spain to a new area was daunting but Suburban Settlers made the transition seamless for us. I was amazed at how at home we were in our new environment within a few months. Not only did they take care of moving, finding us a home and a school but they also were able to pinpoint activities that reflect our cultural background, lifestyle and values. Everyone on their team has become a friend that we feel like will be in our lives for years to come. Darlene was phenomenal on helping us settle in. She spent a significant amount of time on the phone and in-person with us to gather insights about our concerns and needs, such as enrolling my children in school or finding family-friendly weekend events, and provided excellent recommendations along our journey. Her efforts and knowledge along with her wide-network of contacts helped us greatly which relieved the stress and anxiety that our family had felt. We can't say enough about her foresight, insight, and professionalism during our engagement but it was her personal touch that made it unique from all the other corporate relocation companies that we have used in the past..